Synopsis- At the age of eighteen, Julia Jones left her hometown — the small beachside town of Middle Point — with a head full of grand plans. Plans for an exciting life in a town that didn’t involve a main street with one pub or a particular boy named Ryan Blackburn. But after fifteen years and a lifetime later, Julia’s forced to put her career and big-city life on hold when she returns home to finalise her mother’s estate. Which is exactly where she runs smack-bang into the town’s hero, Ry. As in Ryan Blackburn. The sensible thing to do? Stay the hell away from him and head back to Melbourne as fast as her stilettos can carry her! But instead, Julia finds his offer of a helping hand and a hot body too delicious to refuse. Soon, Julia’s ignoring her better judgement and diving into an ‘I’ll think about it tomorrow’ fling with Ry. But what she doesn’t realise is that tomorrow has a way of sneaking up on you…and that saying goodbye to her home town — and to Ry — is so much harder the second time around. 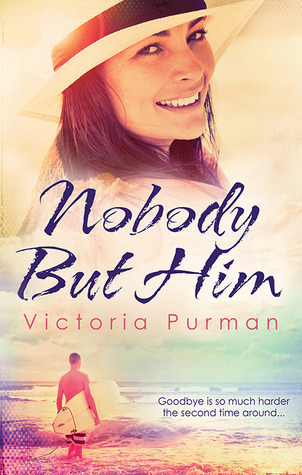 Review- Nobody but Him is the debut novel by Victoria Purman set in the fictional beachside town of Middle Point in South Australia. Julia Jones has returned to her hometown to clear out her family home following the death of her mother. She’s come a long way from the small town Julia Jones who left Middle Point at the age of 18 to become the successful business woman who has made a new life in the city. What Julia doesn’t expect to face when she returns home is her teenage flame Ryan Blackburn who now seems to own half of Middle Point- something that infuriates Julia. She has mixed feelings about her hometown, she doesn’t want to see city slickers take over the beachside town, but she’s also not sure whether she wants to make a life for herself there either. There’s instant tension between Julia and Ryan. It’s obvious “Ry” has never really gotten over Julia, even though it’s been 15 years and he’s still angry at her for leaving him as a broken-hearted teen. Julia on the other hand seems to have moved on, even if the attraction to Ry definitely still exists. When they succumb to the sexual tension and overcome some misunderstandings, Ry and Julia end up spending the night together. Of course, there are further misunderstandings about each of their motives and this seems to drive them apart until the final resolution and happily-ever-after. I loved the setting and the community Purman creates in this story. It felt like the kind of coastal town that you’d visit with your family on holidays as a kid. I liked Julia and the challenges she faced about whether to stay in Middle Point or whether to return to the city. I also really enjoyed the tension built up between Ry and Julia and the bantering that occurs during the story. However, I did feel that their past connection was a little weak. A teenage romance 15 years prior didn’t feel realistic enough to have such an emotional pull on the two characters who were now in their 30’s. Especially Ry’s reaction, I could believe he’d be confused and angry at her because she left, but not the extent of those emotions that were brought up when he saw her again. If on the other hand they’d grown up together and been best friends and then dated- that would have been more believable. But, not just a summer romance that they just could never get over. Anyway, apart from this I enjoyed Purman’s writing style and the Australian coastal setting where this romance takes place.